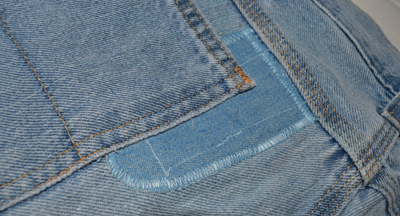 Mending seems to be an art of the past, at least at my house. I still collect things to mend, but they seem to sit and wait an eternity for me to get around to them. My husband shortens his own pants, lest he have to go “pantless”. He can sew on buttons too. Despite my button collection and sewing a zillion on a small bag, I don’t do buttons either. Recently all this has changed. Moose, one of my youngest daughter’s friends from college, has recently stopped by and brought me his weight lifting pants and shirts to take in. I am not sure what they are made of, but each time I take a tuck in them, I know I am to stitch each seam several times over. These weight lifting suits protect muscles from herniating, and Moose must wet them to allow the stitching to stretch as he puts them on to be sure that my seams won’t break and leave him unprotected. These under suits are very expensive and so each tuck carefully done extends the garment’s function by several months. This is a huge savings to a serious weight lifter. 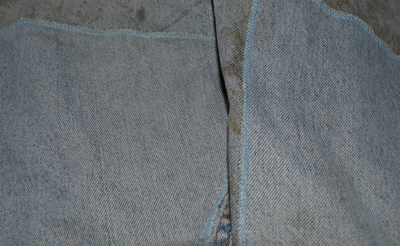 Moose didn’t stop with his weight lifting clothes, and he recently brought me his work blue jeans to mend. 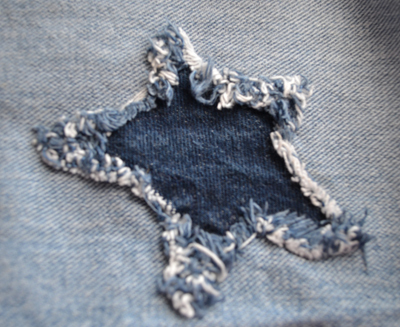 I scratched my head and questioned the point of mending them, as they were so worn and stained. Whatever happened to “a stitch in time saves nine”? These were going to take more than nine stitches to be sure. I knew it would be a challenge to find strong enough material to hold the patches secure. “I love them”, he said. “They are so soft and comfortable now, besides which, I like to support the locals”, he added proudly, knowing that my husband still hasn’t found full-time work. 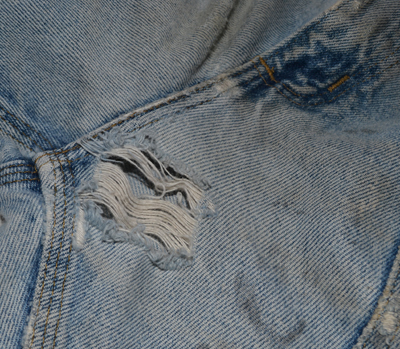 There was no pressure on the timing of mending these. Judging by the looks of them, they had been retired for some time, and he added that his wife was wanting to just throw them out, but he had carefully rescued them from such a fate. Dreading the task, I got to them and as with any sewing job, I was soon enjoying the task. 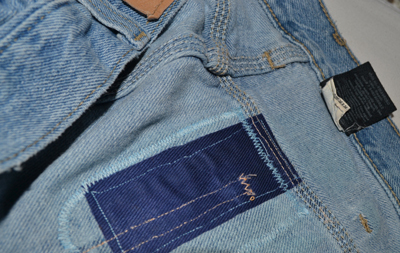 The challenge was there, and with my bag of iron-on-denim patches, I was soon trimming the holes of their fabric- free threads, reinforcing what needed to be reinforced with iron on patches and then sewing on nice big patches. He will be surprised at the sizes of the patches, but they had to be that big to find solid enough fabric to stitch them to. I am proud of my mending, and will not charge him a lot. He is a hard working lad and working equally as hard to stretch his dollars and thoughtful enough to support us locals (or should that be locos?). 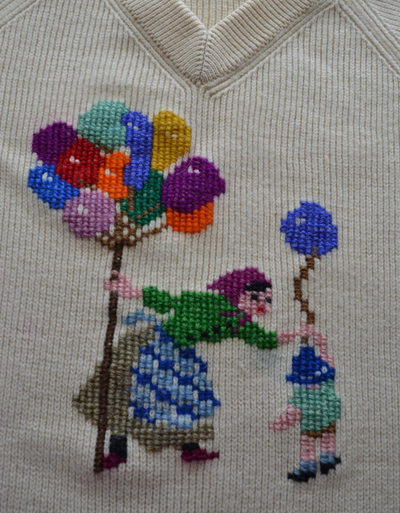 I am remembering the days when I remodeled hand me downs, and covered stains on my two favorite sweaters with some wool cross stitch designs and then saved them for they had become real works of art. Mending can be one of the most creative tasks for a sewer! I am learning too that many long term projects need creative fixing for what doesn’t come out just perfect. 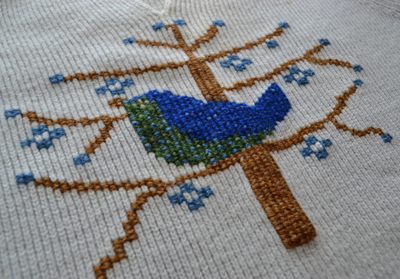 Mending is like doing a challenging puzzle and stretches my brain, giving me practice for those other creative ventures. Of course in this day and age when time and money are at a premium, it must be a well-loved item to deserve this attention!